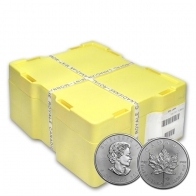 The Royal Canadian Mint issue a number of silver bullion coins. 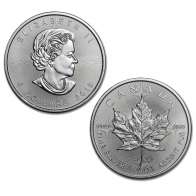 The most popular is the silver Canadian Maple Leaf coin, which is available in 1 Ounce and 10 Ounce sizes, and individually or in monster boxes of 500 coins. 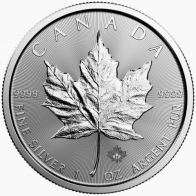 The Canadian Mint also release a number of special edition silver coins, including the Birds of Prey series and the Canadian Wildlife series. 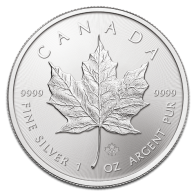 The Canadian Maple Leaf series is one of the best selling bullion coin series available, and can be purchased in gold, silver, platinum and palladium. 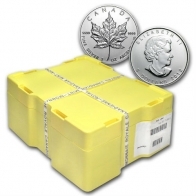 Silver Canadian Maple Leaf coins can be purchased for VAT-exempt storage in Switzerland or for delivery worldwide. Silver coins may be purchased in four currencies and with Bitcoin.